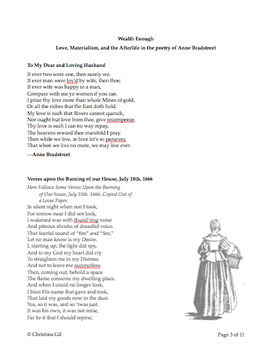 "To My Dear and Loving Husband" and "Upon the Burning of our House" are great poems to introduce colonial america, Puritan world view, and early American Literature. 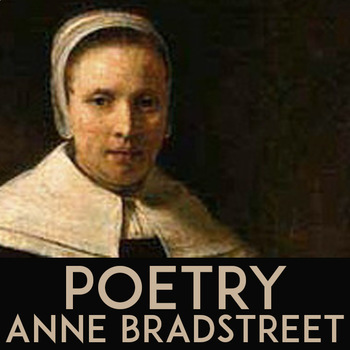 As one of the first poets of the nation, Bradstreet’s ideas on love, life, materialism, and the afterlife reflect many popular views of her era. 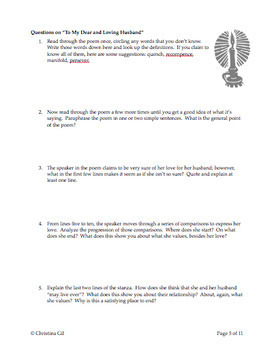 This lesson is aimed at an honors or AP level class. Lower level classes may struggle with some of the older language. 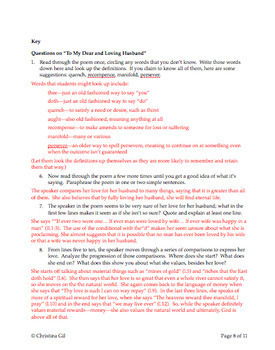 Still, with more direction—by taking them through the poem and asking them to focus on specific words and phrases—they will gain a sufficient understanding of the text. Paired Texts: These poems could be taught in a unit on early American Literature, including texts such as “Sinners in the Hands of an Angry God.” They could also be taught with books written later about the Puritan era, such as The Scarlet Letter or The Crucible. Texts that deal with love and materialism including The Great Gatsby and The Death of a Salesman would also be good matches.